Will Artificial Intelligence Strengthen Your Security Stance? The volume and frequency of cyber-attacks makes it impossible for security analysts to use manual threat analysis to keep up with a rapidly changing threat landscape. Innovations in artificial intelligence (AI) now make it possible to automate mundane security operations, and provide security analysts with access to large data sets. The benefits are significant: analyst time is freed-up, and they have access to better information enabling smarter, faster decisions about how to continually improve the security posture of their organization. 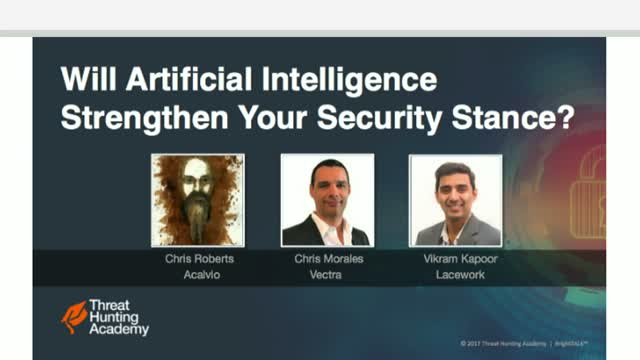 Join this Q&A panel on how AI can help improve your organization's overall security. Massive data breaches are a dime a dozen these days, affecting more people that before and exposing the highly personal information of millions of consumers. Uber is the latest company to disclose a major breach, joining Equifax from a few months ago, in which the names, addresses and other personal data got stolen by hackers. - What should enterprises do to better protect their customer data? - How can we address the growing threat of cyber attacks? Some of the industry's top minds will provide their insights on the impact of the recent breaches on consumers, organizations and policy. The Vectra Bootcamp offers a live 30-minute introduction to the Vectra product and its underlying technology. In this session we will provide a foundation for understanding how Vectra can help you detect even the most advanced threats while making your security team faster and more efficient. We will provide a live demonstration and include interactive Q&A to answer any questions you may have. Get started with Vectra, and learn to find more threats with less effort. Don't miss this 30 minute session with Beau Canada, vice president of information security at Ticketmaster, as he will explain how artificial intelligence in the Vectra cybersecurity platform automates the hunt for hidden cyber attackers inside the organization's network. Learn how AI has helped secure transactions with more than 400 million fans and protects the brand identity of more than 20 countries. Encrypting files is where ransomware attacks end, not begin. Understanding the attack lifecycle can save your critical files from destruction. Jacob Sendowski is a Senior Product Manager at Vectra Networks where he is responsible for detections and algorithms as well as hardware platforms. Jacob was previously at Intel, where he held roles in both Intel Capital and Intel Labs. He has a Ph.D. in Electrical Engineering from Caltech. This video discusses the results of the Incident response preparedness survey conducted by Vectra at BlackHat 2017. The sample size of 459 respondents provided some really interesting data points. Watch the video to learn about the effect of AI and team size on the time to detect, confirm and remediate incidents. This session focuses on Vectra's cybersecurity AI solution that leverages the Gigamon Visibility Platform for Amazon Web Services (AWS). See how this integration with Gigamon enables Vectra AI software to secure AWS workloads, eliminating security blind spots in the public cloud. Join Vectra and VMware as they discuss cybersecurity challenges in virtualized environments and how their integration improves visibility into hidden cyber attacks in data centers, enabling faster threat detection, response and mitigation. -Gain visibility into traffic between VMs on the same server or different servers, regardless of physical infrastructure and virtualization layers. -Expose attacks against data center applications, data, the physical infrastructure and virtualization layers. -Improve response time and reduce risk using micro-segmentation and adaptive security policy-enforcement. -Build out automated workflow capabilities that create dynamic policies for faster incident response. Join Vectra and Gigamon for this compelling look at how you can detect and respond faster to cyber attackers that hide in your physical, virtual and cloud network infrastructures. Together, Vectra and Gigamon provide a single point of integration that provides network-wide visibility to detect and stop targeted attacks against your physical, virtual and cloud infrastructures. Join Albert Caballero, chief information security officer for HBO Latin America, to learn how to automatically pivot from real-time attack behavior detections in the Vectra UI to Carbon Black Response to expedite forensic investigation and isolate compromised hosts. - How the integration of Vectra and Cb Response automatically brings additional threat context and isolation status from Carbon Black into the Vectra UI, combining network and endpoint visibility for a better understanding of security incidents. - Hear use cases and how the integration of Vectra and Carbon Black enables HBO Latin America to take real-time action against active threats and attacks – without requiring additional headcount.